BELLA flinched when she heard the sound of a door swinging open. She couldn&apos;t see anything, but she could feel the little boy from before nuzzling against her, his small arms slinging around her chest and his head laying gently against her collarbone. She tried to move her arm, but the sound of metal chains echoed throughout the dainty bedroom, and she realized she was chained to the wall. A buzzing light bulb flicked on, and Bella&apos;s eyes squinted to adjust to the illuminated room. 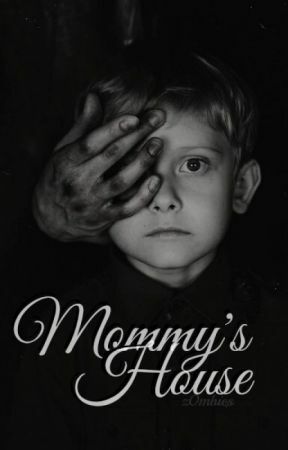 Mommy was standing in the middle of the room, her tall and skinny figure covered in a loose black dress. Her witch-like features were accentuated in the new lighting: her curved nose, her stringy red hair, her small eyes and yellow teeth. Everything about her appearance sent a bout of chills down her spine. Beside Mommy was an obviously drugged-out, older boy, reaching Mommy&apos;s stretched height of around six-foot but possibly a few inches shorter than her. His head was down, his thick black hair falling in his face, and his eyes were closed. His arms were tied behind his back and there was a red bandana gagging him, stretching across his mouth. The little boy beside Bella, no more than seven years old, began to stir beneath her chin in his sleep. She looked down to find his big brown eyes staring up at her, tears welling up in them. "Shh," Bella cooed quietly, watching as Mommy had occupied herself with chaining the older boy to the wall across the small bedroom. The older boy was moaning and groaning beneath his breath, his movements glitched and slowing as he shook his head, locked in his forced daze. Mommy stood up and rubbed her hands against her vein-threaded legs. She exhaled and gave a small smile, before her beady eyes looked over to Bella. Bella&apos;s heart palpitated in her chest and her breath escaped her lungs as she locked eyes with the psychotic woman. "Your father thought he could keep my children from me," Mommy spoke, startling the little boy pressed up against Bella. "But I finally found my oldest. Now you are all here." A manic bout of laughter escaped Mommy&apos;s cracked lips as she laced her fingers together. "We will be taking a family photo," Mommy planned casually. "But first, I must finish dinner." Her voice was clearly deteriorated from years of smoking - it was monotonous and broken, yet it still held a jovial undertone beneath it. The combination was absolutely horrifying. Mommy slowly walked out through the bedroom door, slamming it shut behind her and practically shaking the room. Bella stared around at the dirty and peeling, baby-pink wallpaper. Her eyes carefully observed every board game lined up against the walls, every stuffed animal piled in the corners, every dollhouse scattered across the carpet. Her chest was heavy as she then looked at the older boy who was slumped against the wall, his head on his shoulder and his lips parted as he finished out his drug-induced sleep. "I want to go home," said the little boy in a small voice, the first time Bella had heard him speak. The words clenched around her heart, but she promised herself she wouldn&apos;t cry the second she was thrown into that backseat. She promised she would comply and stay strong, because crying would get her nowhere except closer to her demise. Bella, now with the lights on and sobered from her own drug-induced state, was able to see the small boy in his entirety. He had fair skin, the type of fair that was so pale you could see the veins beneath the surface, and his hair was almost bleach blond. His eyes were very dark and big, but his mouth and nose were small. There was dirt staining his white t-shirt and jeans, and that is when Bella noticed he wasn&apos;t tied or chained up at all. "Hey," Bella said gently, and the little boy moved off of her lap, growing hot against her body. Bella stared at him, a small smile forced onto her lips. "Tell me your name," she attempted to make her voice as calm as possible, to distract the young boy from the reality of the situation they were in. The little boy sat in front of her and played with his fingers, his movements jittery and his eyes panicked. "Elliot," he spoke timidly. Bella inhaled sharply and played a bigger smile upon her lips, allowing it to reach her eyes. "Hi, Elliot. My name is Bella." A small smile broke onto Elliot&apos;s mouth as he looked up at Bella. "I wonder where we are. Do you know?" Bella sniffled, her hand reaching out to grab his small fingers. "I&apos;m not sure. Wherever we are, I am sure we will be home soon. Okay?" Elliot nodded, his smile growing. "Who is the woman that told us to call her Mommy before? She is definitely not my mommy." Bella shrugged her shoulders. "I&apos;m not too sure who she is. She is sick, though, so you have to be very quiet when she comes in. Do not cry or try to run, because she might get upset. Does your mommy ever get upset with you?" she spoke softly, very quietly. Elliot nodded again, his smile dropping. "She yelled at me one time because I fed our puppy play-dough. I had to sit in time-out for a whole hour!" Bella laughed, "shhh, remember, quiet voices? This woman might make you sit in time-out too, do you want that?" Elliot shook his head. "Nuh-uh," he whispered. Her thumb rubbed comfortingly against his small hand. "Just stay close to me. I will make sure she doesn&apos;t put you in time-out." The sound of metal jingling against the wall across the room rattled Elliot and Bella, making them jump and look over at the older boy who was beginning to wake up. Elliot scrambled into Bella&apos;s lap again, his head against her heartbeat that throbbed and pulsed at a quick pace. The older boy&apos;s eyes opened, and Bella noticed they were a striking gray colour. She also noticed he had a few contusions littering the area surrounding his thick eyebrows, and a long scar running from the top of his cheekbone to the bottom of his jaw. He made noises around the gag in his mouth, muffling his anger as he attempted to pull his body forward, the chains restricting him. His arms, still behind his back, were trying desperately to pull him free. Bella stared at the boy in fear, as the sound of his angry groans and breaths filled her ears. She knew that a part of survival in a situation like theirs was staying calm, and she worried that the older boy would fail to cooperate. He finally stopped after several minutes of trying, his breath rugged and his sweat-soaked hair falling onto his forehead. His shoulders and chest heaved with each inhale and his light eyes remained locked on Bella and Elliot. The door flew open, and Mommy revealed a new, colourful dress that hung off of her rawboned torso like a pillow sack. Her ginger hair resembled straw, sitting atop her angular shoulders as she pressed her hand against the doorway and watched each of them intently. In her hand was a clunky, Polaroid 660 Land camera. "Picture time, Sweethearts. This is a big day, the day you reunited with your Mommy; we must remember it forever." She held the camera up to the older boy first, making him shy away from her and look to the side to avoid the lens.